Are Kagan Structures compatible with the Rigor/Relevance Framework? If so, where do Kagan Structures fit in? Schools adopting the Rigor/Relevance Framework have asked these questions. Some readers may be completely unfamiliar with this framework. First, let's briefly overview the framework, then explore ways teachers can use different Kagan Structures to make their instruction more rigorous and relevant for students. The framework was developed by the staff of the International Center for Leadership Education (ICLE)1,2. They offer a helpful overview of the framework on their Web site (www.leadered.com/rrr.html), so we'll keep this overview brief. Conceptually, the model is very simple. It places two continuums on a chart. Most educators are intimately familiar with the first continuum. However, we know it as a taxonomy—Bloom's Taxonomy. The second continuum is the Application Model, the ICLE's own model. Bloom's Taxonomy can be thought of as a thinking continuum, increasing in complexity as we move up the continuum. On the "lower-level thinking" end of the continuum is knowledge. Knowledge consists of those discrete facts that students learn. For example, the Civil War was between 1861–1865. On the opposite end of the thinking continuum is "higher-level thinking." Evaluation for example is considered more complex because it often requires knowledge to make an informed evaluation. To evaluate if capitalism is a better economic system than communism, you'd have to know quite a bit about each. 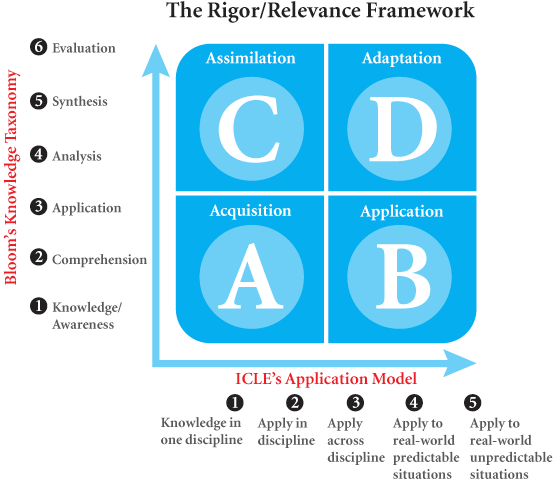 As we move up the continuum, thinking is more complex or "rigorous," as ICLE terms it. That's where the "Rigor" side of the Rigor/Relevance Framework gets its name. Now let's see where the "Relevance" side comes from. On the low end of the continuum, we have the acquisition of knowledge. On the opposite end, we have knowledge being used in the real-world which is often highly unpredictable. For example, what do you do when you see brinkmanship politics over the debt ceiling and know a stock market crash may be looming? The term "relevance" comes from the idea that learning is more relevant to the extent you can apply your knowledge to solve real-world problems and create real-world products. The Framework has four quadrants. Students learn new information and are expected to be able to recall learning. Students learn new information and are expected to be able to apply their learning in real-world situations. Students extend their knowledge to higher-levels, and may apply within the context of the classroom, but not in the real world. Students apply their higher-level thinking skills to real world situations. The framework is designed as a tool for educators to move toward greater rigor in the thinking dimension and greater relevance in the application dimension. The goal: we can achieve higher academic standards and help prepare students for the real-world by adopting instruction, curriculum, and assessment that acknowledges the value of rigor and relevance.